Exporting is one factor that increases economic scale. With it, businesses started to build relationships with other organizations across the world. 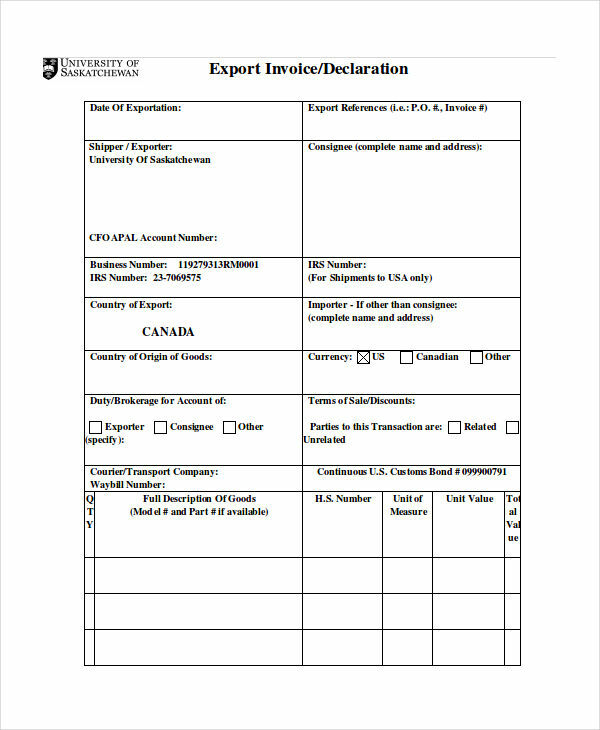 To maintain control over the export transactions, a document commonly known as a commercial export printable invoice is then used to keep track of the export transactions businesses have undertaken. There are different kinds of invoices like invoice for self-employed, hotel invoice, medical invoice, and many more. What most people don’t know: there are special invoices that businesses make when dealing with international or global transactions. These invoices are called commercial invoices. To know more, check out these samples below. 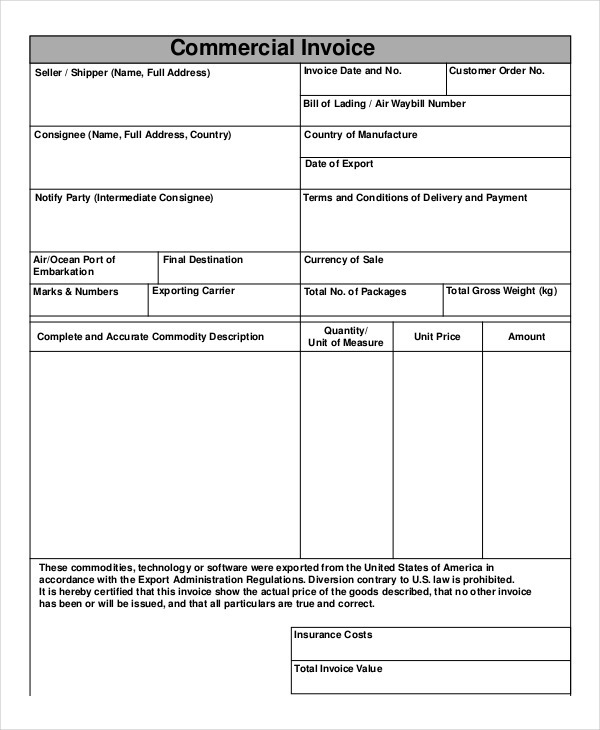 A commercial invoice is another type of invoice document that records all the items or products that a person or a company is shipping out of the country. 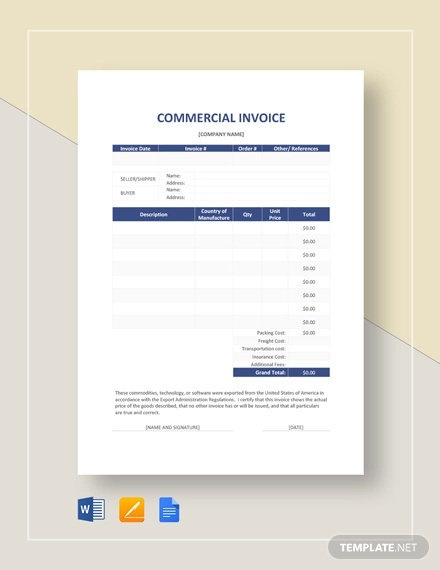 Commercial invoices in pdf are mandated by the government for all transactions involved in selling or buying international items or products. It primarily exists for customs to control imports and exports of the country. 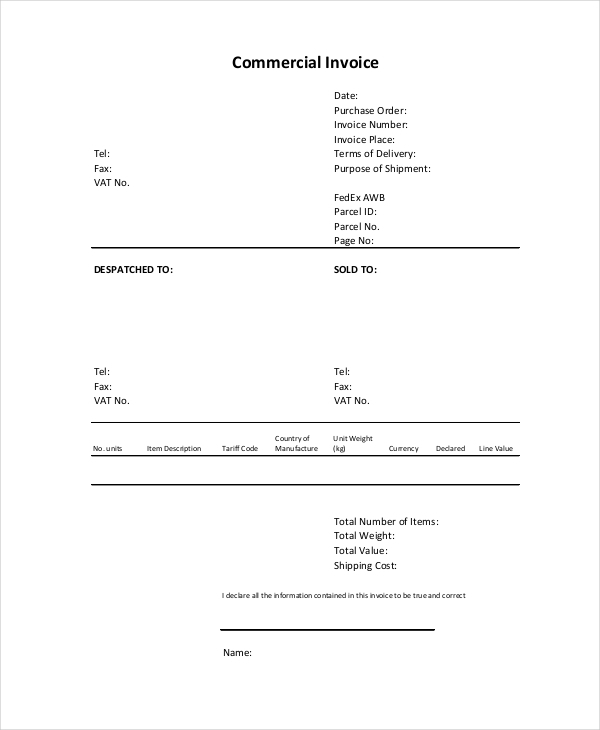 Just by looking at some invoice samples, we can get an idea what purposes they stand for. But, invoices have different purposes depending on what type they are. Importation Control. It is crucial for the customs to know what goods are being sent out of and brought into the country to be able to keep an eye on the exchange taking place and its effect on the GDP/GNP. 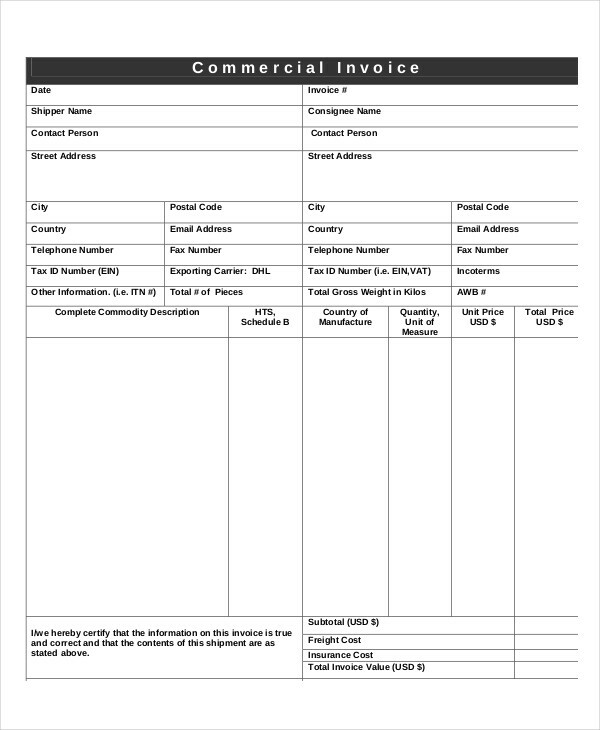 Commercial invoice information includes all of the shipper and the receiver, giving customs full knowledge of the parties involved. Valuation. By the use of commercial invoice, customs will be able to evaluate the goods shipped and keep track of the exchange of products, preventing illegal transactions. Through tracking, calculation of tariffs or other commercial terms are made easy. 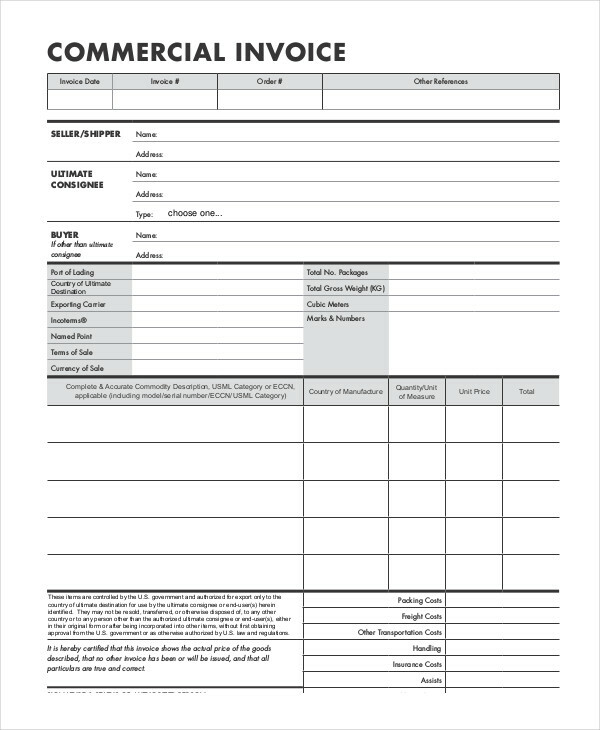 There is no standard format on how to make a commercial invoice form. 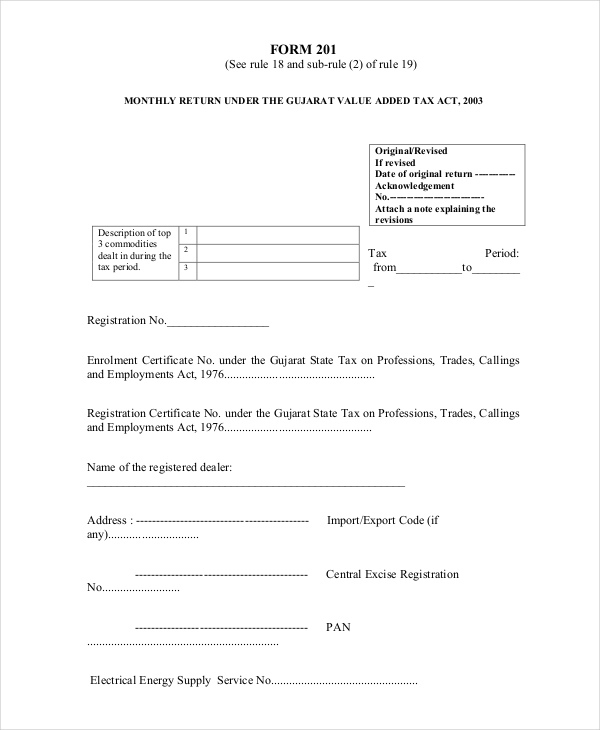 It is only important for these invoices to show specific information that are needed by the receiver and most importantly by the bureau of customs. Aside from being mandated by law for tax purposes, commercial tax invoices are created to serve as evidences that importing sale transactions were made. Most importantly, it prevents the exchange of illegal items. Commercial invoice allows businesses and customs to have full control on the products sold internationally.